It's been two years since we started posting the Gaming App of the Day here at Kotaku, shining the spotlight on a single Apple, Android or Windows Phone game that stood out in their respective crowded marketplaces. It was a good system, but it's one that doesn't work anymore, so it's going away. Late last year I took up the mantle of Kotaku's mobile gaming editor, spearheading an effort to expand our mobile gaming coverage beyond a single app a day or select big-name titles. These days we're writing about at least two or three gaming apps a day. This made things complicated for the Gaming App of the Day format. Say Luke writes up his pick for Monday, and then Monday afternoon I stumble upon the greatest Android game I've ever played. I'd have to either write it as just another game under the shadow of the Gaming App of the Day, or wait until the next day. That's silly. What was also happening was our non-mobile-centric writers (read: everyone not me) would pick a game to play for Gaming App of the Day, only to discover it wasn't very good. We tooled with negative GAOTD posts, but they never really felt right, so it was up to the individual to keep acquiring games until they found one they liked. That's also silly. And so, in order to maintain the sanity of my fellow writers and allow them the option of not liking something (it's a good option), we're going to start doing straight-up gaming app reviews. You'll see how that all pans out on Monday, but I'm excited. In the meantime, check out the games I didn't get around to writing about this week—it's a nice meaty list, filled with little gems. 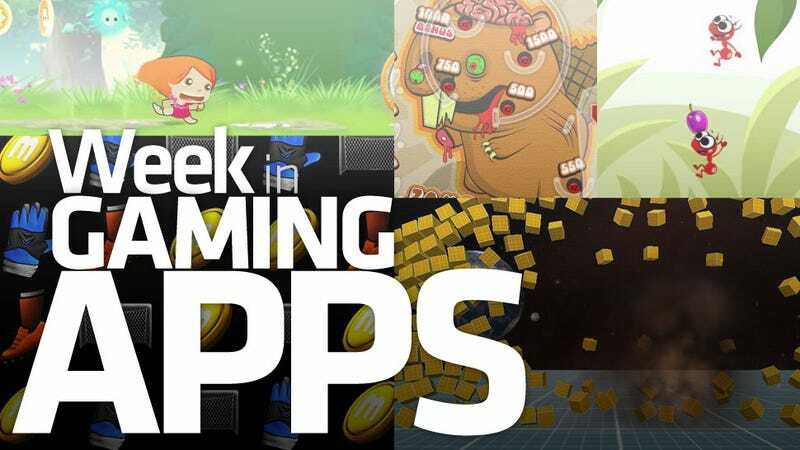 And then scroll all the way down and check out our final five Gaming Apps of the Day. They will be (mildly) missed. A simple snowboarding and skiing game with single-finger controls. Not all that deep, but enjoyable. It's a match-three game with a dragon theme. Not amazing, but good enough for a free download. An iPhone game of the year, just as enjoyable on Android. An addictive little block puzzle with a heaping helping of math, and who doesn't love math? An endless riding, jumping and jousting game built with Unreal Engine 3, so it's shiny as well as entertaining! This is a 2D version of MineCraft, essentially, free but with plenty to purchase in-game, should you choose. Half the players seem to like it. The other half hates it. Your call! Do you like explosions? Do you like causing explosions? Do you like build things and then blowing them up? Not so much a game as a physics toy, Demolition Physics is a good way to work out your aggression. An incredibly cute little runner with a hero that develops magical powers as you progress through the game. This is one you should definitely grab. A tribute to the old plastic handheld pinball games of yesteryear—you know the ones with the tiny ball bearings in them? Ah, memories. Get the ants to the exit in this adorable little physics puzzler. Really picks up once the rocket twigs show up.